Iron.io has a product called IronWorker which provides a task oriented Linux container that you can run your programs inside. If you are not sure what I mean, think of this as having a temporary Linux virtual machine instantly available for your personal but short term use. IronWorker allows you to load your binaries, code files, support files, shells scripts and just about anything else you may need to run your program in the container. You specify a single task to execute, such as running a shell script or a binary and IronWorker will perform that task when requested. Once the task is complete, IronWorker will tear down the container as if it never existed. If you are developing in Windows or on the Mac and plan to load and run pre-built binaries in IronWorker, they must be built for Linux. If that could be a problem don’t despair, you have options. You can create an Ubuntu VM so you can build the Linux binaries you need. This is what I do. I don’t develop in my Ubuntu VM, I use it as a testing and staging area. Your second option is to build your program inside of the IronWorker container and then execute it. You have a lot of flexibility to do what you need with IronWorker. I highly recommend that you buy VMWare Fusion or Parallels and create an Ubuntu VM. Most of the cloud based environments you may choose to use for your testing and production environments will be running Linux. It helps to stage and test things before uploading code to these environments. I use VMWare Fusion and I love the product. VMWare Fusion will cost around $60 USD and Ubuntu is FREE. I run Ubuntu 12.04 LTS but version 13.04 is now available. In this post I will be using my Mac for everything. So if you are running Windows you should be able to follow along. Once you see how to build your applications inside the IronWorker container, you will know how to load and run Linux binaries. For those who are interested in setting up or using Ubuntu, read the next section. If you want to continue in your Windows or Mac environment, go to the Installing Ruby section. If you decided to go ahead and install an Ubuntu VM or you already have one, awesome. Here are a few things you will want to do so you can use IronWorker. The first Icon in the Launcher bar is the Dash Home Icon. Select this and perform a search for the Terminal application. You will see several terminal applications show up. Select the Terminal program, which will launch a Terminal Session. Now back in Launcher you will see an icon for the Terminal session you started. Right Click on the Terminal Icon and select Lock To Launcher. Make sure the Terminal session is the active program and move your mouse to the top of the screen. The menu for Terminal will appear. 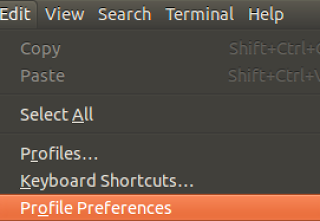 Under Edit choose Profile Preferences. 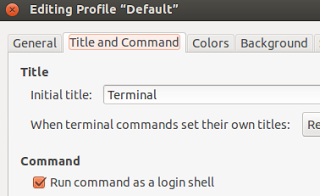 Then select the Title and Command tab and check the Run command as a login shell. We need this for our Ruby programs to work properly in our Terminal sessions. Before we can start using IronWorker we need the latest version of Ruby installed. IronWorker provides a Ruby based command line tool that allows us to upload IronWorker tasks for the different projects we create. Once you are done skip to the next section called Installing IronWorker. Use the backslash when running the command. This prevents misbehaving if you have aliased it with configuration in your ~/.curlrc file. There may be a newer version of Ruby by the time you are reading this. But as long as the version is greater than or equal to 2.0.0 and has the =* operator in front, you will be all set. Just make sure you specify the version correctly. This should display the name of the directory back in the Terminal session. With Ruby properly installed we can install the IronWorker tool. This tool is a Ruby program that allows us to create tasks by uploading our programs and support files into IronWorker. To install the tool we must install the IronWorker Ruby gem. Gem’s are Ruby packages that get installed under the default version of Ruby. This is why I stressed we have the right default version set. Now we have our environment setup to talk with the IronWorker platform. Make sure you do this in all of your environments. This will copy, build and install the code into the example folder under $HOME. The program has been written to test a few things about the IronWorker Linux container environment. Let’s review the code for the program first and test it locally. For IronWorker to be really effective you want to build programs that perform a specific task. The program should be designed to be started on demand or on a schedule, run and then be terminated. You don’t want to build programs that run for long periods of time. The test program runs for 60 seconds before it terminates. There were two things I wanted to know about IronWorker that the program tests. First, I wanted to know how logging worked. Second, I wanted to know if the program would receive OS signals when I requested the running program to be killed. With all that said let’s review the code we are going to run. There is nothing fancy here, just an abstraction layer so I change out the logging mechanism if this doesn’t work. // Create a channel to talk with the OS. // Create a channel to let the program tell us it is done. // Create a channel to shut down the program early. // Launch the work routine. // Ask the OS to notify us about interrupt events. // Signal the program to shutdown and wait for confirmation. I like to shutdown my applications gracefully, so if I could receive an OS signal on a kill request, that would be fantastic. I am not a channel guru and I am sure there are better ways to accomplish this. I welcome any suggestions. For now this is what we got. The function creates three channels. The first channel is used to receive signals from the OS. 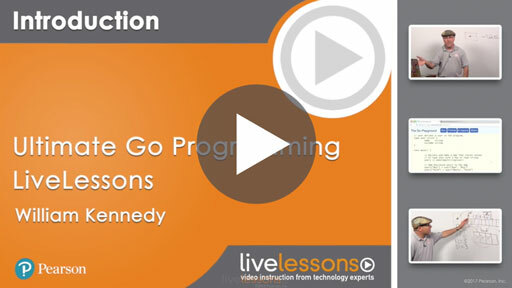 The second channel is used by the Go routine that is performing the program logic to signal when it is done. The third channel is used by the controller to signal the Go routine to terminate early if necessary. The program.DoWork function is started as a Go routine and then the controller waits for either the OS to signal or the running Go routine to signal it is done. If the OS signals to terminate, then the controller uses the shutdown channel and waits for the Go routine to respond. Then everything shuts down gracefully. The DoWork function prints a message to the log every 250 milliseconds 240 times. This gives us a minute of work that must be performed. After each write log call, the function checks if the shutdown channel has been signaled. If it has, the function terminates immediately. In your native environment, mine being the Mac, download the code and let Go tool build and install the application. As soon as I hit <Ctrl> C the OS signaled the program with the syscall.SIGINT message. That caused the Controller to signal the running program to shutdown and the program terminated gracefully. Select the Key icon which is where you will find the Credentials for this project. We need these credentials to create a special file called iron.json. This file will be required by the IronWorker Ruby program to load our tasks into this project. export GOGCCFLAGS="-g -O2 -fPIC -m64 -pthread"
This script tests to see if the ironworker test application already exists. If it doesn’t, it then proceeds to download the latest Linux binary package for Go and builds the program using the Go tool. Once the build and install is complete, the script executes the program. If you have a repository that requires authentication you can use this technique. This calls git clone the same way the Go tool does, so everything is copied to the right directory structure. If your code references other libraries, you will need to do that manually. If you run the Go Get command with the [-x] option, you can see all the calls the Go tool issues. Just copy what you need and add it to your shell script. IronWorker does have a copy of the Linux binary package for Go version 1.0.2 already pre-configured in every IronWorker container. The script installs the latest version to show you how that can be accomplished if the version you need is not the one installed. The technique can also be used to install other packages that might be required. Go back to the Iron.io website and let’s see if our new task is there. 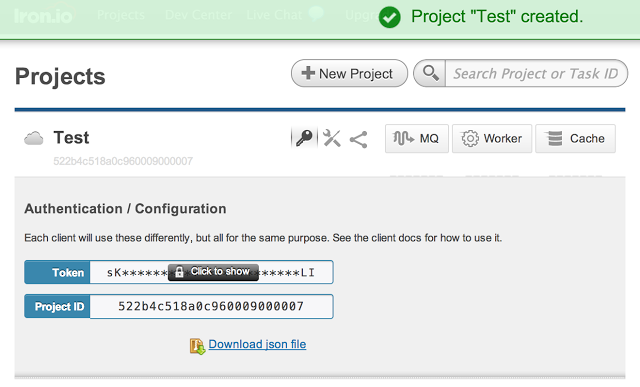 Select Projects again from the main menu and select the Worker button to the right of your Test project. There is a big grey button that says Queue a Task. Let’s hit that button to run our task. This dialog box will popup. Use all the defaults and hit the Queue Task button. This will queue the task and then it should start running. The task will start in the queued state, then running and finally complete. Once the task is done, click on the Log link. You will see the shell script did everything perfectly. It downloaded Go and successfully built the program. Then it started executing it. Let’s run the program again and check two things. First, let’s see if the container is saved and the download of Go does not have to occur again. Second, let’s kill the program early and see if it receives any OS signals. You can see that I killed the task 21 seconds into the run. When I look at the logs I am a bit disappointed. First, the task downloaded Go again. This means I have a new and clean IronWorker container every time the task runs. Second, the program did not receive any OS signals when I issued the kill. It appears the IronWork container is forced to die and the program gets no OS notifications. It is not the end of the world, just something that is good to know. Based on this new information it seems we want to load binaries into the IronWorker container when we can. This way we don’t need to spend time downloading things that can be pre-compiled. However, I was able to use IronWorker from my Mac environment which is a real plus. On the other hand, having Go build and install your program every time could be huge. If you upload code changes to your repository you don’t need to upload a new revision of the task. The Go tool will pull down the latest code, build it and run the program. Then again, that could cause problems. At the end of the day you need to decide what is best for your different scenarios. What’s awesome is that IronWorker gives you all the flexibility you need to make it work. Builder Tasks are a hidden gem within IronWorker. A builder task allows you to build your code and generate a task that you will use for your application inside of IronWorker. This is really the best of both worlds because you don’t need to download Go and build the code every time the task runs. You can do your build once. Your application task runs immediately because it is always ready to go with the binaries and other support files it needs. Go back into the scripts folder and find the sub-folder called buildertask. Let’s quickly run through the files and see how this works. The task-builder.sh file is the script that knows how to build our code. The code downloads Go and then uses the Go tool to build the program. At the end of the script we copy the binary that the Go tool built to the IronWorker staging area. Anything you copy to this folder will be placed into our new application task. The task.sh file is the script that is executed by the application task. In our case we only need to run the binary. Remember the binary is being created by the task-builder.sh script file. The worker file tells IronWorker that our application task is a binary and to load and run the task.sh script. Next we have the build command. This tells IronWorker to perform a remote build by exexuting the task-builder.sh script. The file command pulls the task-builder.sh file into the builder task so it can executed remotely. This is where we copied the binary to the staging folder build. We didn’t have any errors or problems coping the final binary. When you look at the log you can see the program starts running. There is no downloading of Go or any other build work. Using a builder task is a great way to have IronWorker stage and build the code for us. If you change the code and need to perform another build you must run the IronWorker program again. This will create new revisions of both the builder and application tasks. You can’t rerun the Builder task manually. Looking at the logs in IronWork is a real convenience but you will want to use a third party system to manage your logging. I love PaperTrail and the IronWorker integration is seamless. After you get your account and login, go to the Dashboard. Make sure you accept logs from unrecognized systems and select the group you just created. Then hit the Update button. Take the PaperTrail url and enter it into the Logger URL text box using udp as the protocol. Click the Update button and then click on the Worker button again and find the buildandrun task. The udp must be lowercase or your task will fail. You should start seeing events coming into your group. Click on the All events drop down on the right and you will see the logs in PaperTrail. I just scratched the surface with how you can use IronWorker to run your applications. This is a really flexible environment with really no restrictions. You have access to download and install any packages you need, access to the local disk and integration to PaperTrail and a few other logging systems. Though you don’t need a Linux VM to use IronWorker, you may want to consider having one so you can stage and load your binary programs directly. Again, you have the flexibility to use IronWorker as you see fit. I hope you try out the service. Use my application or build your own. Post a comment about your experience and anything new your learn. I plan on using IronWorker for two projects I am working on and expect only great things.